Minister for Justice & Minister Assisting the Prime Minister for Counter-Terrorism Michael Keenan with ECAV staff Kathy Horne, Sigrid Herring, Natalie Short, Marlene Lauw and Jo Campbell. 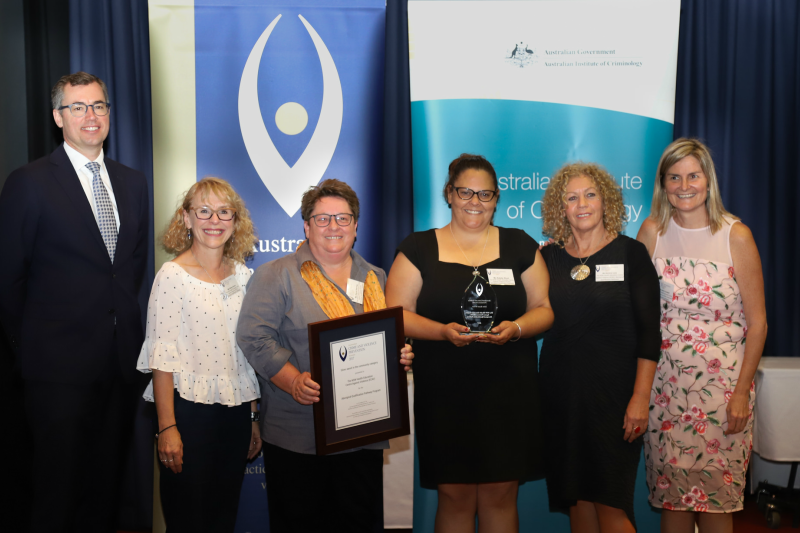 WSLHD’s Education Centre Against Violence (ECAV) Aboriginal Qualification Pathway has received a silver award in the community-led category of the 2017 Australian Crime and Violence Prevention Awards (ACVPA). The ACVPAs recognise best practice in the prevention/reduction of violence and other types of crime in Australia. “Aboriginal community or health workers can enter ECAV’s four-tiered Aboriginal Qualification Pathway through community development programs and can then progress into various qualifications right up to a Masters in Social Work,” said NSW Health Education Centre Against Violence director Jo Campbell. “I am proud of the ECAV Aboriginal Team and what they have achieved and continue to achieve for their people; it’s through their hard work and commitment that the program is making a real difference. The ACVPA award recognises ECAV’s ground-breaking work,” said ECAV Aboriginal team leader Marlene Lauw. The annual awards recognise the outstanding contributions made across Australia in crime prevention, including the development and implementation of practical projects to reduce violence and other types of crime in the community. “The ECAV Aboriginal Qualification Pathway is the only one of its kind in Australia. Congratulations to NSW Health for supporting a holistic approach to training that builds specialist skills in Aboriginal workers in health services and across their interagency partners,” said acting Australian Institute of Criminology (AIC) director Nicole Rose PSM. “Achieving better integration across the service sector is integral to addressing violence, abuse and neglect in Indigenous communities. “There is a high need to deliver trauma-informed counselling practices that are embedded in Aboriginal worldviews. All projects are assessed by the ACVPA Board, which consists of senior law enforcement representatives from each state and territory police service, and is chaired by the acting AIC director. NSW ACVPA Board representative Chief Superintendent Brad Shepherd said the ECAV Aboriginal Qualification Pathway was an innovative program that had provided education for Aboriginal people across urban, remote and rural areas in NSW for more than 30 years. “Programs like these enable communities to develop trauma counselling skills and build resilience within their communities. The goal of reducing violence, abuse and neglect creates safer communities and NSW Police Force recognises these targeted programs that support crime prevention and reduction,” he said. The awards are a joint initiative of the Australian, state and territory governments, co-ordinated by the AIC and co-sponsored by the Law, Crime and Community Safety Council. Time to vote: who’s your favourite nurse or midwife? 21 Feb, 2019, 4:43 pm Sia Anthopoulos Comments Off on Time to vote: who’s your favourite nurse or midwife?